855 Carriageway Trails 103, Snowmass Village, CO 81615 (MLS #158591) :: McKinley Real Estate Sales, Inc. This charmingly-decorated 3-bedroom condominium is the very definition of a ski-in/ski-out property - the Dawdler trail is right outside the living room door. SE-facing and on the first floor ''point'' of the building, the condo is filled with light most of the day. It features an updated kitchen and baths, a gas fireplace, all new bedding and accessories, W/D, and two patios with views of the slopes. 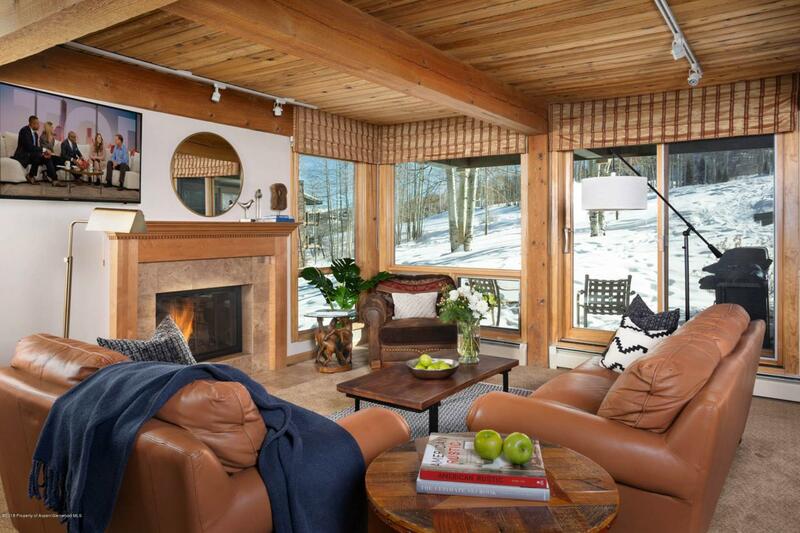 Stands of aspen outside the windows give the property an alpine ambiance, and it shows beautifully. Assigned one-car carport and a year-round water feature are just outside the front door. Easy walk to the TOV Gatehouse and pool . Free shuttle bus service throughout the resort. The TOV is considered one of the best-managed complexes in all of Snowmass. Contact brokers re disclosures. Listing provided courtesy of Compass Smv. Listing information © 2019 Aspen/Glenwood MLS. All Rights Reserved. Information Deemed Reliable But Not Guaranteed.